How to Convert DVD folder with Any DVD Converter Pro. Home > Support > Convert DVD folder with Any DVD Converter Pro. DVDSmith Movie Backup is DVD backup software for copying DVD to hard drive as DVD folder. You can use this software in conjunction with DVD burning software of your choice, to make a backup copy of any DVD video disc, or with Any DVD Converter Pro to convert your DVD folder to MP4, AVI, 3GP or other video formats for your iPod, PSP, mobile phones and many portable media players. DVDSmith Movie Backup can make perfect-quality backup copies of all your DVD movies using your own computer hard disk. It can keep the same sound & video quality when you backup your DVD movies with all the special features, menus, subtitles, and languages included. Within a few clicks of your mouse, your favorite DVD has been cloned and will be playable on your computer with free media players like SMPlayer, The KMPlayer and VLC Media Player and Media Player Classic . Newly released Movie DVDs like Wall-E, Sleeping Beauty, Iron Man, Disaster Movie, Bangkok Dangerous, can be easily copied to your hard drive with DVDSmith Movie Backup. How to convert DVD folder on hard drive with Any DVD Converter? Any DVD Converter Professional is an All-in-One DVD ripper and video converter which helps you rip DVD disc and DVD folder to all popular video formats and convert video files between all popular video formats with fast converting speed and excellent video quality. It is a video converter which converts almost all video formats including DivX, XviD, MOV, rm, rmvb, MPEG, VOB, WMV, AVI to MPEG-1, MPEG-2, MPEG-4, 3GP or FLV movie formats. It can also rip DVD to MPEG, rip DVD movie to AVI, WMV, MPEG, 3GP video, MP4, etc., which's playable on your iPod, iPhone, iPod touch, Apple TV, Zune, PSP, Walkman, Archos, Creative Zen, iRiver PMP, Sandisk Sansa and other portable video device, 3GP phone, MP4/MP3 player, PS3, wii, Xbox360 and so on. Trial version of Any DVD Converter Professional can be downloaded from Any-DVD-Converter.com or Any-Video-Converter.com. After copying DVD to hard drive as DVD folder with DVDSmith Movie Backup, you can use Any DVD Converter Professional to convert DVD folder on hard drive to other formats for playing on iPod, iPhone, PSP, mobile phones and so on. With the help of DVDSmith Movie Backup and Any DVD Converter Professional, you can enjoy any DVD movie on any device. Converting DVD folder on hard drive with Any DVD Converter Professional is easy and fast. Just follow the steps below. 1. 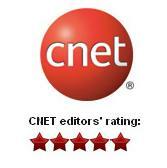 Open Any DVD Converter Professional. 2. 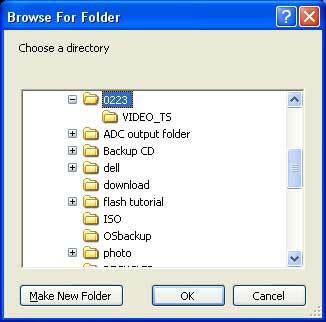 Click menu by "File --> Open DVD folder" to add the DVD folder on hard drive to the DVD ripper. 3. Browse for DVD folder on hard drive. 4. Select the title of the DVD for converting. Normally, the main title will be highlighted. If you need to convert the entire DVD folder as a file, you can check "do not seperate a DVD video disc as titles" from menu "Edit --> Options --> DVD" before adding the DVD folder on hard drive to Any DVD Converter. 5. Select an output format for converting DVD folder on hard drive. 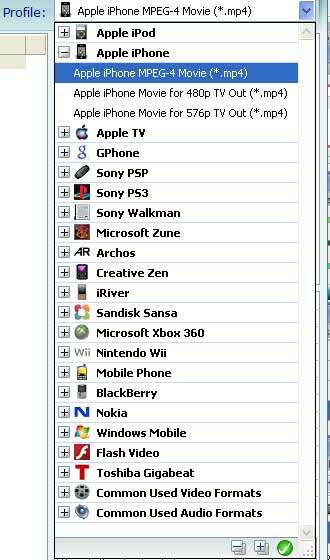 Any DVD Converter Professional supports almost all the devices. You can easily enable or diable any output formats. 6. Set the video and audio parameters in the right panel. For DVD disc or DVD folder, DVD Options are available. Here you can specify the chapters you need to convert, audio language, subtitle and angle. 7. After all th settings are finished, simply click the "convert" button to star converting DVD folder on hard drive with Any DVD Converter. If you have DVD disc that can't be converted by Any DVD Converter Professional, there may be DVD copy protection in the DVD disc. Don't forget to use DVDSmith Movie Backup to copy DVD to hard drive as DVD folder first, then follow this instruction to convert the DVD folder.